The International Wire and Cable Symposium (IWCS) was founded in 1952 to plan, promote, initiate and coordinate the exchange of technical information on wire, cable, and fiber optics within industry and government. This international symposium is considered to be the premier venue for new technologies in wire, cable and connectivity products, attracting about 1,000 attendees from around the world. Although they are a technical organization themselves, IWCS had not yet embraced technology as part of its conference execution. Many attendees of the conference appreciated having another printed volume of conference proceedings to add to their collections, but its limited distribution made it difficult for IWCS to leverage this industry-shaping content to increase visibility and attendance for the event, and raise the global profile of the organization. IWCS worked with Omnipress to create a more blended conference strategy, providing more value to all industry members. The overall design of the existing event website was updated, and a content library was created, consisting of both current and archived conference proceedings. Conference attendees still receive a printed book of proceedings, but the online library allows all industry members—including those that have not yet discovered the annual conference—to access content quickly and easily. 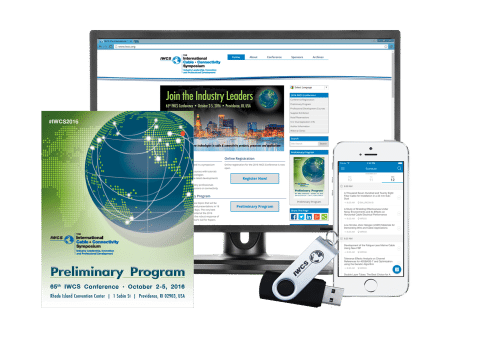 IWCS also worked with Omnipress to introduce a mobile conference app featuring session handouts, programs and speaker information, attendee profiles, and pertinent conference details to provide on-site access to content. IWCS rapidly learned that going digital boosts attendee engagement. Attendees spent time with the papers and handouts ahead of time, and came to the sessions prepared for discussion more than ever before. IWCS has also increased the visibility of their conference—and its content—to prospective attendees and to the industry at large.